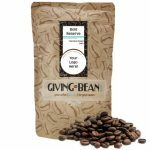 Giving Bean Coffee Fundraiser - What's In our Products? All Regular Coffee: Fresh roasted 100% arabica coffee beans! 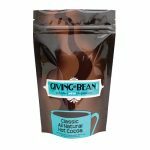 Flavored Coffee: Fresh roasted 100% arabica coffee beans and natural & artificial flavoring. * Our coffee flavoring does not contain any wheat or gluten products, wheat, rye, barley or their derivatives, milk products, dairy products, dairy derivatives, eggs, egg products, soy, soy products, seeds, tree nuts, peanut products, and other legumes or seafood products, fish or shellfish, celery, mustard, sulphur dioxide and sulphites. Classic Natural Cocoa: Whole milk powder, raw cane sugar, Dutch cocoa (processed with alkali), natural flavoring, sea salt. Bombai Chai Latte: Raw cane sugar, whole milk powder, black tea, organic cinnamon, ginger, sea salt, non-GMO expeller pressed canola oil, clove, cardamom, mace, spice extractives. *Processed on equipment that also processes: Crustacean Shellfish, Egg, Fish, Milk, Peanut, Soy, Tree Nuts (Almond, Brazil Nut, Cashew, Coconut, Filbert (Hazelnut), Macadamia Nut, Pecan, Pine Nut, Pistachio, Walnut) and Wheat. Every effort is made to never have cross contamination of the allergens. Vanilla Bean Shortbread: Unbleached unbromated wheat flower, wheat flower (wheat flour, malted barley flower, niacin, iron, thiamin mononitrate, riboflavin, folic acid), butter (milk), cane sugar, cage-free eggs, pink sea salt, pure ground vanilla beans, vanilla bean extract (water, alcohol, glycerine), baking soda. Contains: egg, milk, & wheat. Produced in a facility that uses soy, peanuts and tree nuts. Kosher certified. 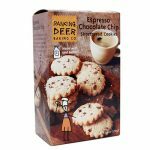 Espresso Chocolate Chip Shortbread: Unbleached, unbromated wheat flower, wheat flower (wheat flour, malted barley flower, niacin, iron, thiamin mononitrate, riboflavin, folic acid), butter (milk), cane sugar, semi-sweet chocolate (sugar, unsweetened chocolate, cocoa butter, soy lecithin (an emulsifier), vanilla), cage-free eggs, pink sea salt, ground espresso beans, baking soda, vanilla bean extract (water, alcohol, gycerine). Contains: egg, milk, soy, & wheat. Produced in a facility that uses peanuts and tree nuts. Kosher certified. Blue Horizon: Apple hibiscus, rosehip peels, orange peel, natural & artificial flavoring, and cornflower pedals, sweet and fruity with a hint of vanilla. Caffeine-free. Blood Orange: Apple, hibiscus, rosehip, orange peel, orange pieces, natural flavoring, and safflower, rich and tangy. Caffeine-free. Earl Grey: Black tea blended with oil of bergamot and natural flavoring. Ginger Lemon: Ginger pieces, lemongrass, lemon peel, liquorice, and spearmint. Caffeine-free. Green Tea Mango: Tropical mango pieces, flavoring, and sencha green tea. Kosher certified. Jasmine Green Tea: Jasmine scented fouzhou green tea. Moroccan Mint Green Tea: Gunpowder green tea blended with spearmint, natural flavoring, smooth and refreshing. Mountain Gold: Rooibos, orange peel, cinnamon, clove, and flavoring, spicy-sweet. Caffeine-free & Kosher certified. Organic Applicious Green Tea: Organic Chinese Chun Mee green tea with dried ripe apple pieces, natural flavoring, subtle with a hint of fresh juicy apple. Caffeine-free. Organic Darjeeling: Delicate floral notes, slightly fruity with an assertive finish, black tea. 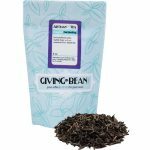 Organic Ginger Black Tea: Warming ginger with assertive organic black tea. Organic Green Tea: Chinese style sencha green tea, sweet and pleasant grassy flavor. Organic Rooibos: Dark mahogany cup with notes of vanilla, apricot, and honey. Caffeine-free. Organic Tropical Zinger: Ginger, pineapple, natural flavoring, and calendula petals blended with sencha green tea. Paradise Passion: Black and green tea blended with papaya, rosehips, passion fruit, flavoring, sunflower and flavoring. Pretty in Peach: Apple pieces, hibiscus, mango, papaya, sunflower petals, and peach flavoring. Caffeine-free. Red Berry Basket: Apple, elderberry, currant, rosehip peels, blackberry, raspberry, hibiscus, sour cherry, and flavoring, sweet with a tart finish. Caffeine-free & Kosher certified. Ti Kuan Yin Oolong: Floral orchid aroma with notes of toasted walnut, gentle and warm. Welsh Morning: Classic ceylon black tea, robust and smooth. *Our tea flavoring does not contain any wheat or gluten products, wheat, rye, barley or their derivatives, milk products, dairy products, dairy derivatives, eggs, egg products, soy, soy products, seeds, tree nuts, peanut products, and other legumes or seafood products, fish or shellfish, celery, mustard, sulphur dioxide and sulphites.